I have a VMC controlling a 3-phase motor. The 0-10VDC board output control speed perfectly. I have an index pulse input. I am using 2 of the 3 relays, one for RUN CW and one for RUN CCW. If both relays are on or off, then the VMC turns motor off. This works correctly. I am controlling a pair of servo motors for X- and Z- axis. While these are servo, they motors have builtin pulse and direction inputs, with builtin encoder. The connection, then, to the motor control is +5 and PUL- and STEP-. These also work correctly. The 3rd relay control the primary of a solid-state relay, which turns on/off the coolant pump. I am powering the board with USB, +24DC from a Meanwell power supply. This power supply also powers the two axis motors. The limit switches simply connect loops from the pin to ground screw. Very simple. Mach3 runs it all, and I am using a Sony VAIO junker laptop from 2002, parallel port. USB powers this board, along with the 24V power. The product appears to be of high quality, but this product would best be sold to an experienced user as no documentation is included. 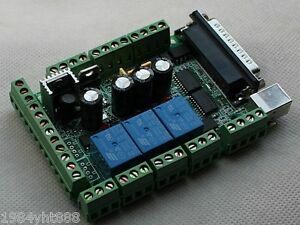 If you've installed these type of boards in the past you;ll be able to figure it out, but would not recommend for a first time user. If you don't... well you will buy an other 5 or six until you get it to work accordingly! !